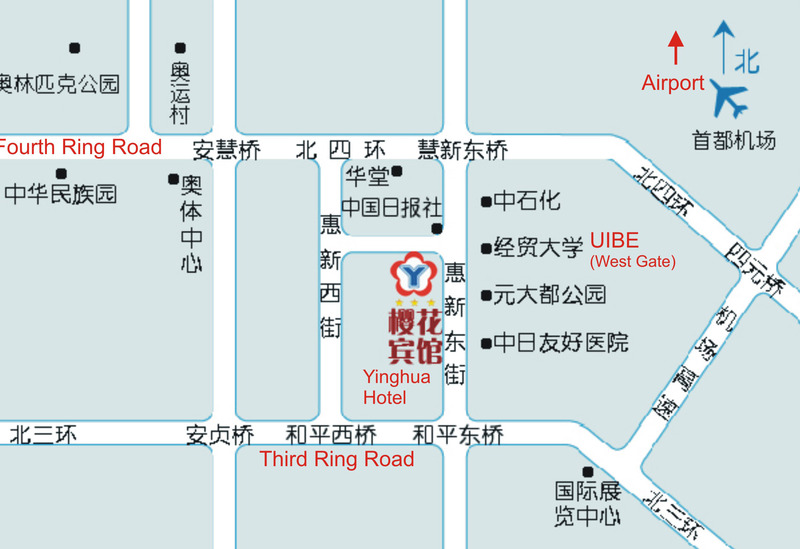 For those who will arrive at Beijing Capital Airport, the easier way to come to the hotel is to call a taxi. Depending on which airport terminal building your airlines will use, following the taxi sign. After getting into a taxi, show a sheet of instructions to the taxi driver. (The instruction sheet in both Chinese and English can be downloaded here. Please download it and bring it with you to China.) Two more points to note: Citizens of certain countries (e.g., the US) will need a visa to come to China. Please check out how you can get one if you don't have one. Second, make sure that you remember which airport terminal building your airlines uses (usually either terminal building 2 or 3). Usually the one you use when you come is the one you will use when you leave, as long as you are using the same airlines and the same route. Those who want to arrive by bus may note that the following bus lines would come to the campus: 419, 361, 684, 984, 62, 602, 119, 379, and 125.